Nano-ceramic colors are now available. Unlike the industrial powder coatings found on some rings, nano-ceramics are safe, hypoallergenic and made specifically for jewelry. Gold, blue, red, maroon, violet, green, fuchsia, rhodium, copper, orange, pink, turquoise, pine green, wine red, rose gold, chestnut brown and extreme black colors are currently available, select the color in the comments section if its not available in the drop down menu. 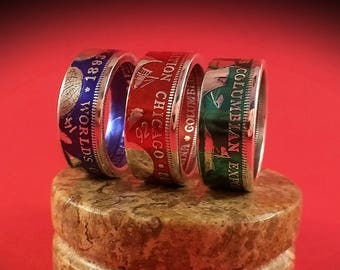 Until now, the smallest sizes were never practical for coin rings, the coin's details would be ruined in the forging process. 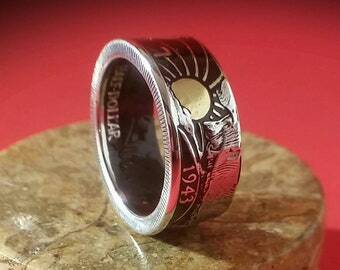 If you always wanted a Kennedy silver half dollar pinky ring or if you have smaller sized hands, this ring can finally be custom made for you, in whichever size you choose and with the coin's FULL DETAILS INTACT! About the coin: Intended as a memorial to President John F. Kennedy, this coin was authorized by Congress just over a month after his death. Use of existing works by Mint sculptors Gilroy Roberts and Frank Gasparro allowed dies to be prepared quickly, and striking of the new coins began in January 1964. Upon their release in March 1964 due to collectors, hoarders, and those interested in a memento of the late president, silver Kennedy coins vanished from circulation. Although the Mint greatly increased production, the denomination was seldom seen in circulation. Starting with 1965-dated pieces, the percentage of fine silver was reduced from 90% to 40% (silver clad), but even with this change the coin saw little circulation. Kennedy half dollars for the year 1964 are 90% silver, 1965 through 1970 are 40% silver and all other years are copper/nickel clad. 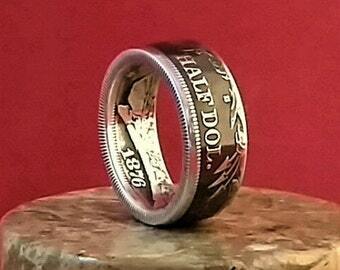 The rings listed here are 90% silver. The color will last a long time. If needed, the color can be reapplied and the refinishing can be done for a small charge. 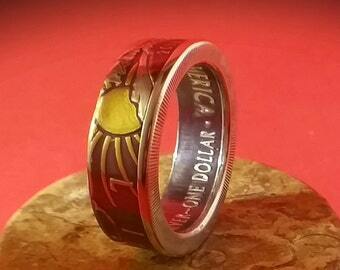 About the ring: This ring is a beautiful collector's item, it is forged from a coin with sharp details. Various band widths and shapes are available. 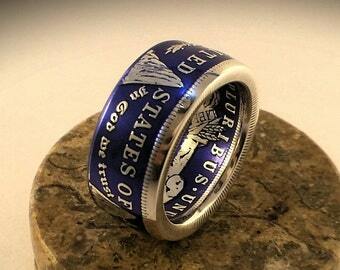 The patina is applied and the lettering and images carefully polished. A scratch resistant sealant is applied which will keep the patina intact for a long time. 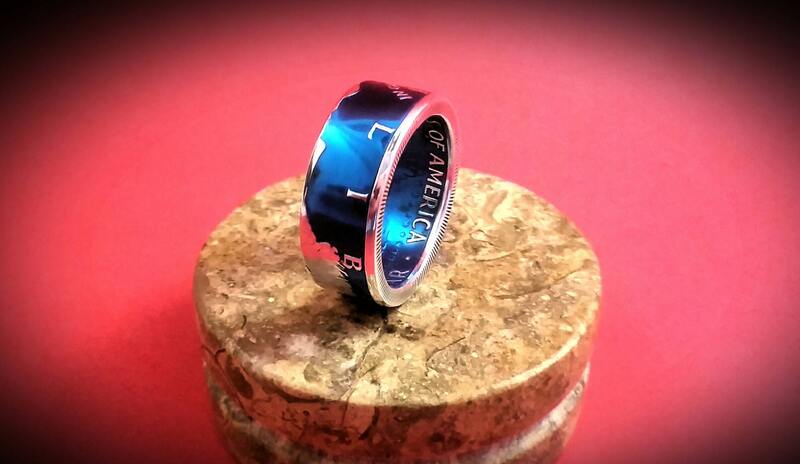 Please specify in the comments, whether you'd like your ring made with the date side out or in. About silver: silver comes from dying stars, in the cataclysmic supernova explosions that sometimes marked their final demise. This is the only place where temperatures get hot enough to fuse hydrogen nuclei together to form larger atoms. Since all of earths silver was created in the explosions of supernovae, when you wear a ring made from silver, you are wearing stardust!